100 metres across a reserve to the estuary, our bach looks out to the spectacular skyline of the Coromandel Ranges. There is an outdoor entertaining area which is great for BBQs. Shopping area, tennis courts, skateboard bowl, basketball court, minigolf and golf courses are all within a few minutes walk. For younger children there is a playground within view and close enough to call children home for dinner. Fishing from the wharf is a popular activity. For those who are keen on more active pursuits there are 3 bikes and 3 kayaks with life jackets. The ocean beach is a short drive or a 15 minute walk away. The challenge of climbing Mt Pauanui before breakfast motivates some! If you just want to chill, the outlook is wonderfully relaxing. Sunsets are often brilliant. The birdlife along the estuary on those late afternoon walks is always fascinating. Just out of view, but actually very close, are the Waterways canals. In Winter our house is warmed by a fabulously efficient wood burner. There are two separate living areas - one with the television/DVD player, one for those who want to talk. Sky is available if you bring your own Sky card. The famous Hot Water Beach is a 45 minute drive away and the walk to Cathedral Cove less than an hour's drive. We built this property as a haven for our family who all enjoy frequent visits. Pauanui is a very special place for us. We love its opportunities for kayaking, cycling and walking. Very close to shops, golf course, minigolf and tennis courts. Kayaks in garage. The house is 300 metres from the Pauanui village of shops, community centre, church and library. Our house look across the Tairua Rover to the Coromandel Range and the sunset beyond. Lovely house, great location & perfect for families! We loved our stay. The house had everything we needed (well stocked kitchen, laundry, pantry basics) and a playground close enough that we could sit on the porch and watch the kids! (But not too close that it was noisy.) Easy walk to shops and restaurants. Communication with the hosts was excellent. Thank you Catherine, for your kind and positive response. We’d love to have you back any time. The bach was large and practically laid out for a family, scenery picturesque opening onto the estuary, large BBQ area to eat around on summer evenings. Beautiful clean, spacious home in wonderful location. Throughly enjoyed our stay. Thank you for sharing ?? A brilliant batch - perfect for little kids! We had the best time! This batch has everything you need AND SOME! Perfect for little kids - it even has a balance bike! Couldn’t recommend this batch more highly - wonderful hosts, brilliant position and beyond equiped! The house was a great size in a brilliant spot. Super tidy and well equipped with all the essentials. We really enjoyed our stay. Great location, very family friendly, clean and well kitted out. Great location, very family friendly, clean and well kitted out. The fire was lovely. Will hope to return in summer. 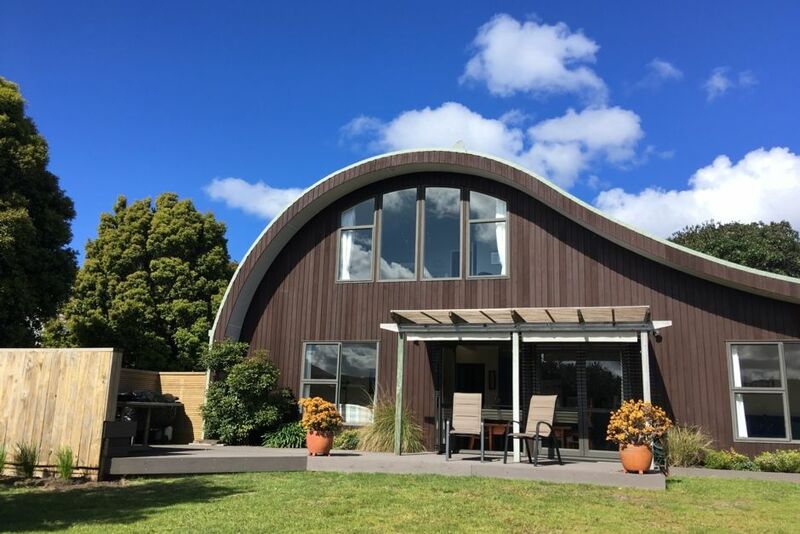 Our house is set on the Pauanui Peninsula opposite Tairua at the mouth of the Tairua River. The estuary is used for boating of various kinds, from sailing, kayaking to waterskiing to jet skiing. 1 km from the house is the beautiful ocean beach which is framed by Mt Pauanui to the south and Paku to the north. There are opportunities to go on fishing trips and to see glowworms in the hills. Pauanui is at the gateway to all that the Coromandel Peninsula has to offer. Beautiful beaches and walking tracks abound.